Artistry, innovation and subtle yet sophisticated color define this stunning Micro Pave Halo Smokey Quartz Ring in 14K White Gold. A unique gemstone stars in this uniquely crafted take on a time-honored style, and the end result is a look that is truly exquisite. 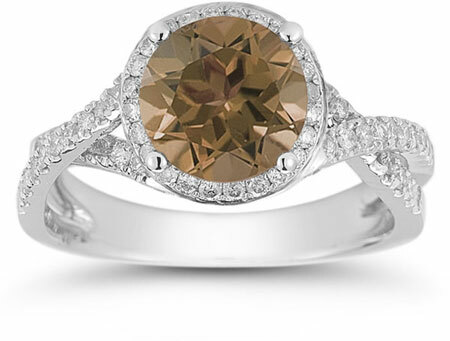 The warm yet soft hue of the center stone in this chic style gives this ring a look that's upscale and intriguing. This 8mm round smokey quartz really does live up to its name in that it displays a subtle brown glimmer that calls to mind a curl of smoke rising in the autumn air. The glamour of this stone lies in its understated warmth, and its alluring sparkle gently but surely draws the eye. Accenting this intriguing semiprecious gemstone are 0.66 carats of dazzling diamonds; these 94 small round stones encircle the smokey topaz with an elegantly sparkling frame and highlight the curves of the unique setting as they stud the gracefully curving band. The 14K white gold band of this contemporary style splits into two halves that twist around each other like two partners in a harmonious dance. 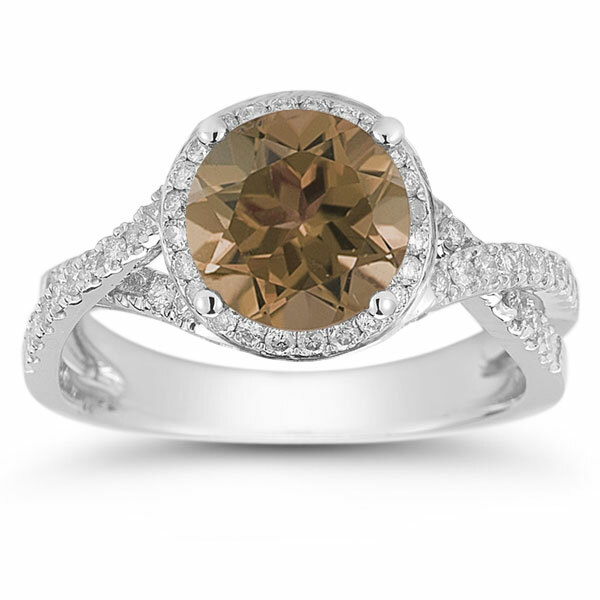 This show-stopping intertwining silhouette makes this smokey topaz and diamond ring is a truly exquisite piece. We guarantee our Micro Pave Halo Smokey Quartz Ring in 14K White Gold to be high quality, authentic jewelry, as described above.